MS Dhoni turned back the clock as he scored an unbeaten half-century and guided Kedar Jadhav, who impressed with an 81-run knock from the other end, as India outclassed Australia by six wickets in the first One-day International (ODI) to take a 1-0 lead in the five-match series in Hyderabad on Saturday. Scoring the winning runs, MS Dhoni, unbeaten on 59, and Jadhav helped India chase down the target with 10 balls to spare. Earlier, Indian bowlers restricted Australia to a below-par 236 for seven after they opted to bat at the Rajiv Gandhi International Stadium. 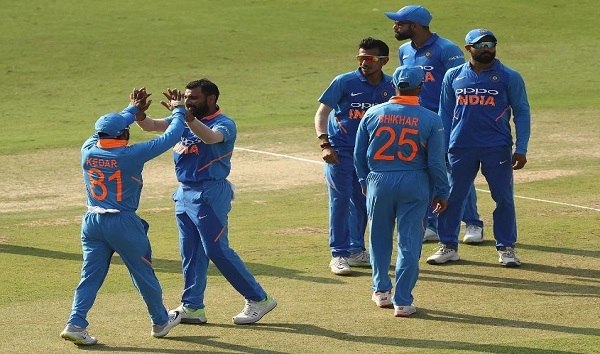 It was a brilliant performance from the bowling unit which maintained discipline for the better part of the 50 overs with Mohammed Shami (2/44 in 10 overs) showing the way. Kuldeep Yadav (2/46 in 10 overs), Ravindra Jadeja (0/33 in 10 overs) and Kedar Jadhav (1/31) made up for a rare off-day for Jasprit Bumrah (2/60 in 10 overs), that too, by his standards. Even Usman Khawaja (50) and Glenn Maxwell (40), the top two contributors for Australia, weren't exactly comfortable against an Indian attack that bowled as many as 169 dot balls. This effectively meant Australia couldn't score 28.1 overs out of the 50 overs during Indian innings. What the statistics won't reveal is the contribution of Kedar as the sixth bowler and Jadeja, who stifled the Aussies during the second Powerplay. This was after Shami bowled a brilliant wicketless first spell which was seen off by Marcus Stoinis (37, 53 balls) and Khawaja (50, 76 balls), who added 87 runs for the second wicket after early dismissal of Aaron Finch. 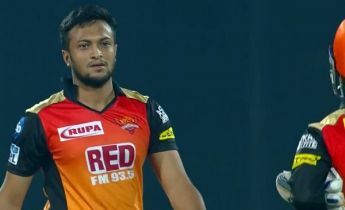 It was Khawaja, who was first to break the shackles with a cover drive off Bumrah and a six off Kuldeep, introduced in the last over of the first Powerplay. With only 38 runs coming in the first Powerplay, the duo especially Stoinis decided to up the ante against Indian bowling's weakest link Vijay Shankar (0/22 in 3 overs), hitting him for a flurry of boundaries. In the next five overs, Australia scored 33 and looked like regaining ground when Jadhav (1/31 from 7 overs) got a lucky breakthrough with a rank half-tracker. Stoinis mistimed the pull shot to Virat Kohli at mid-wicket. Khawaja completed his sixth half-century in ODIs but couldn't get the elevation while giving Kuldeep the charge. Shankar took a well-judged catch at deep mid-wicket boundary running sideways. Maxwell joined Peter Handscomb at 97 for three and the duo farmed the strike well during their run-a-ball partnership. Handscomb was using his feet well but Kuldeep managed to produce a classical chinaman's delivery. Handscomb was deceived twice - first in the air and then it broke back sharply for Dhoni to complete the easiest of glovework. Once Handscomb was out, India controlled the second Powerplay with Kedar and Jadeja choking the run-flow. Despite not getting wickets, Jadeja bowled two miserly spells - 5-0-15-0 and 5-0-18-0. To top it, he was hit for only two boundaries and bowled 34 dot balls. It was a tough period to bat as Maxwell and debutant Ashton Turner (21) found out during their 36-run stand for the fifth wicket before Shami got his reward in his second spell, removing both of them.Dhoni, Kedar Jadhav guide India to beat Australia.